Wales had waited 58 years for this, their first match at a major tournament since the 1958 World Cup. It was the opening weekend of Euro 2016, Slovakia the opponents, Bordeaux bathed in sunshine, the Welsh anthem moving many to tears. Dreamland. But less than three minutes into the match, it looked like that was all about to fall apart. Slovakia's talisman Marek Hamsik picked up possession in the Welsh half, glided past Ashley Williams and Joe Ledley with one turn, wrong-footed James Chester and bore down on goal. Off-balance but still able to strike the ball cleanly with his left foot, Hamsik's shot beat goalkeeper Danny Ward and looked destined for the net but then, from nowhere, Ben Davies came sliding into view to clear the ball out of play. It was an astonishing effort, prompting a cry of disbelief from Hamsik and interrupting television commentators who had already started praising the goal. "It was a special moment," says Davies. "At the time it was pure instinct. "Things could have been a lot different at the Euros for us had that gone in." Hamsik could not believe it, and he barely can today. "I remember this moment," he says with a wry grin. "It was unlucky because I did a very good individual action and unfortunately I didn't score. I remember it well." After that reprieve, Gareth Bale and Hal Robson-Kanu scored as Wales won 2-1, setting them on their way for a momentous run to the semi-finals. 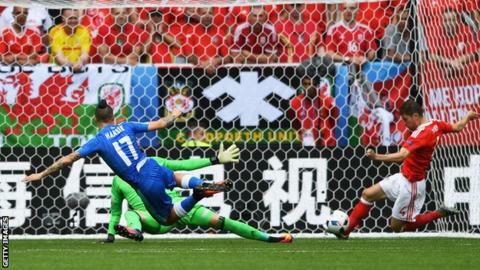 Had Hamsik's shot gone in, one wonders how severe a blow it might have been for Wales. "I've seen it back a couple of times and it's always nice to look back on," Davies says. "It's a good memory, but hopefully I won't have to do it again this time around." Davies and Hamsik will meet again on Sunday when Wales begin their Euro 2020 qualifying campaign against Slovakia at Cardiff City Stadium. With World Cup runners-up Croatia the favourites to win Group E, this match could have significant ramifications for the qualification hopes of Wales, who are the group's second seeds, and Slovakia, who are third. There will be added pressure for Wales, who are already playing catch-up having sat out the opening round of matches when, on Thursday, Croatia beat Azerbaijan and Slovakia won against Hungary. It makes Wales' rematch with Slovakia on Sunday all the more intriguing, with Davies and his team-mates hoping to replicate their exploits in France. "That game in Bordeaux was probably one of the best games in recent memory," said the Tottenham defender. "It was a tough day against a good side, but that's in the past now and now we need to kick on and start the campaign well. "It was a big game at the time but we want to replicate that, it has to start here. "It's not going to be an easy group, we are well aware of that. You have to win your home games and we have to start at 100 miles per hour."